I had wanted to visit Prague in forever. 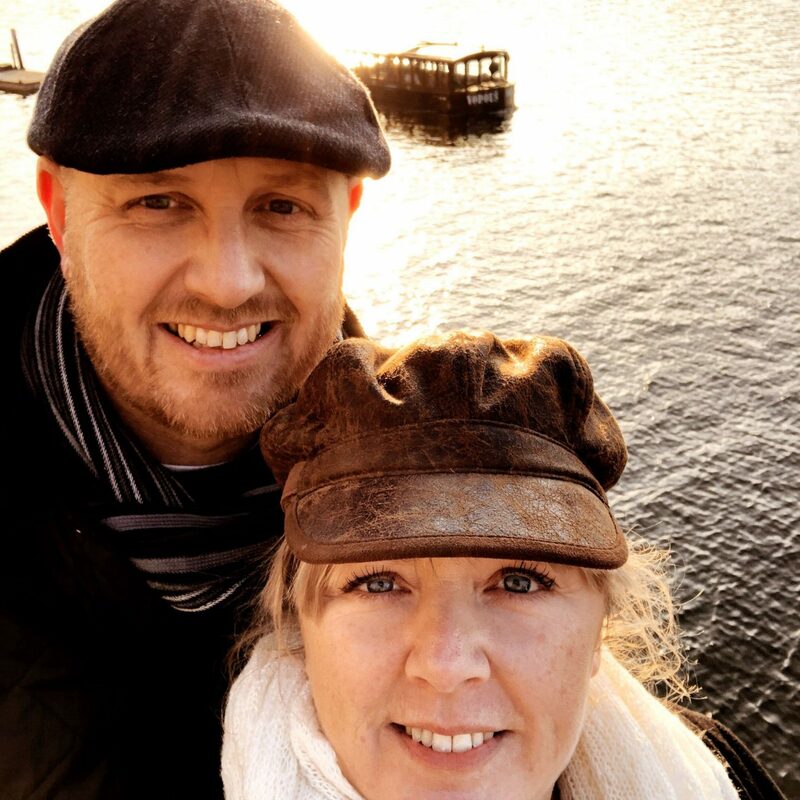 I longed to explore the city in the colder months, as I always saw photos of Prague with a thin blanket of snow, people wrapped up warm and cosy against the weather, sipping warming mulled wine. Those visuals gave me all the hygge feels. I wanted to carry on our exploration of the European cities we had taken on with gusto this year, with Prague as our next stop. You can read about Salzburg – My Top Six Things To do if you need more mini break inso. When we saw flights back in May for a great price, it seemed like the signs were there, it was time to cross this city off of our list. We decided to go the week before the Christmas markets started. The reason for this was that we wanted to do all the touristy things, and knew once the markets opened, the crowds would flock! It was a good shout as we didn’t have to que for anything. 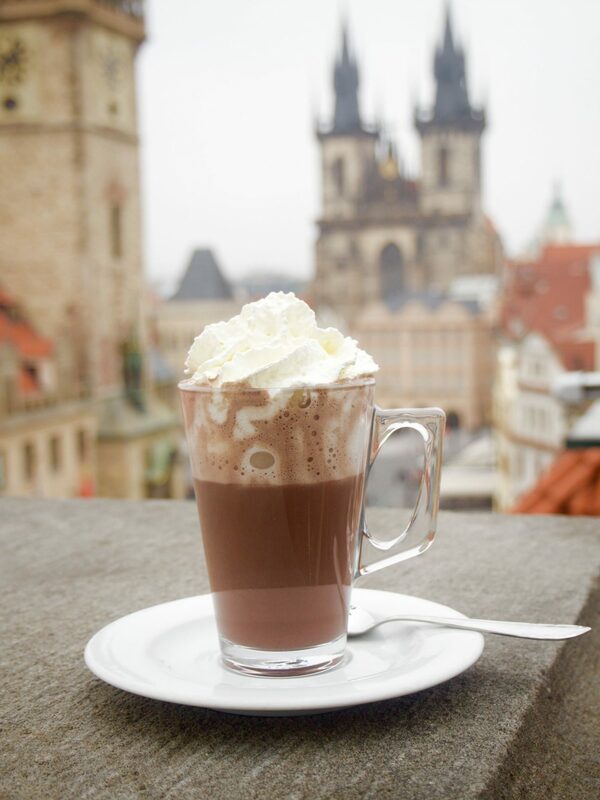 So, here we go, your guide to Prague in the Autumn. We have just returned, and it was everything and more. We had many variations of weather too! The morning we landed we had a smattering of snow, which I was very excited about! This then cleared and we had bright blue skies. The following day, we had snow for about 4 hours. It was amazing to see Prague in all weathers. I thought I would give you a run down of the practical information firstly in this post, before going on to tell you a tale or two about what we did, in another post. 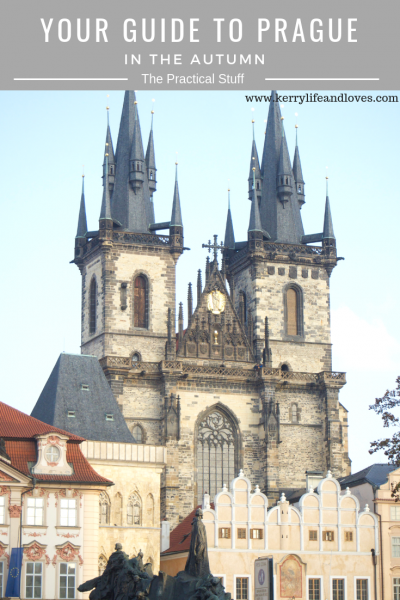 As I said, we were very lucky with our flights to Prague, and paid just £70 return for both of us with EasyJet. That was paying for allocated seats too! Bargain. The flight from London is just an hour and forty minutes, so its very quick. Great for a rubbish flyer like me (I know, I know, the amount of flights I do you would think I’d be great)! When you get to Prague, you have a few options to get into town. You can get public transport, a private taxi or your hotel transfer. We used public transport as I like to experience the normal local life! I think you see a lot of the residential side of the place too. The bus you need is number 100 or 119. You get this right outside the airport, and it takes you to the metro. Here, you change to a train and it takes you right into Town. We had booked a hotel in the Old Town, so the nearest stop for us was Mustek, which is on the A and B train lines. It was then just a five minute walk to our hotel. Simple, cost effective (around £1.50 each) and just a 35 minute journey in total. The Hotel, which we had booked bed and breakfast for, was perfect, and as the reviews I had read before we booked said, you couldn’t get a better location. Check in was easy, the reception staff were incredibly helpful and friendly, and we were pleasantly surprised by the size of our room. 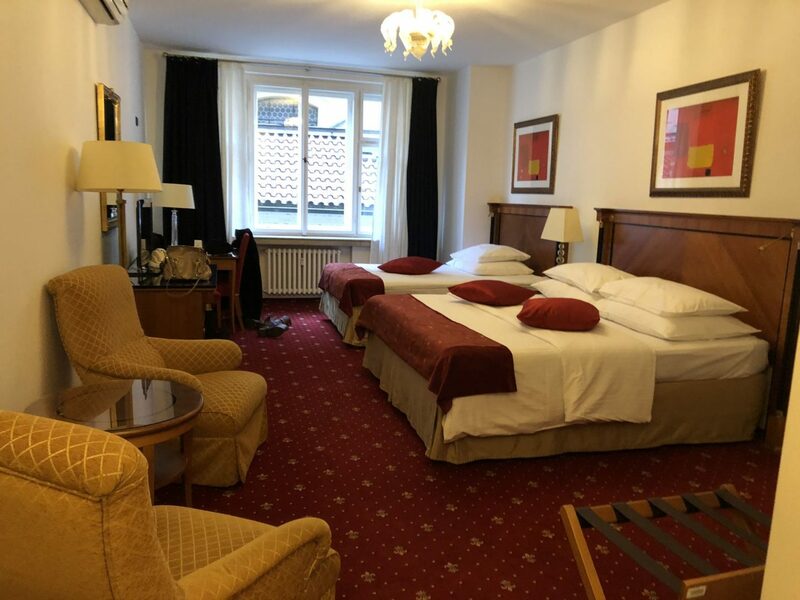 It had a huge super king bed, as well as a double bed, (just incase we had a row or something haha) Often the rooms in city hotels can be quite “boutique” cant they! The bed was amazing, and I would go as far as to say, that it was one of the most comfortable hotel room beds I have ever slept in. I loved that bed! The breakfast each morning is served between 7.30 and 10.30, and was your usual cooked breakfast, with cereal and continental style breakfast buffet. There was plenty to eat, and it was all fresh. The hotel has great wifi, that works in the rooms as well as public areas. There is not a bar in the hotel, although there is plenty of places to grab a drink in the street. There was a little noise one morning, which we learnt was the bin men, but other than that we heard no disturbances. Although the hotel is fairly basic, it is perfectly located, clean and very comfortable. Prague has a great reputation for its food, and we can see why. The Czech cuisine is very hearty, plentiful food. It is warming and delicious and although quite meat heavy, I as a non meat eater did not struggle to find things to eat. All around the Old Town square area, there is a huge choice of restaurants to eat at. On our first night, we made the mistake of going out starving hungry, so we didn’t spend to much time looking for a place to eat. We saw an Italian restaurant right in the square, and went there. The food was lovely, we had no complaints about it, but we did think it was pretty expensive for what essentially, was two pizzas! We definitely paid for location. Subsequent nights, we went a little off the beaten track, down side and back roads, and came across some amazing places to eat. 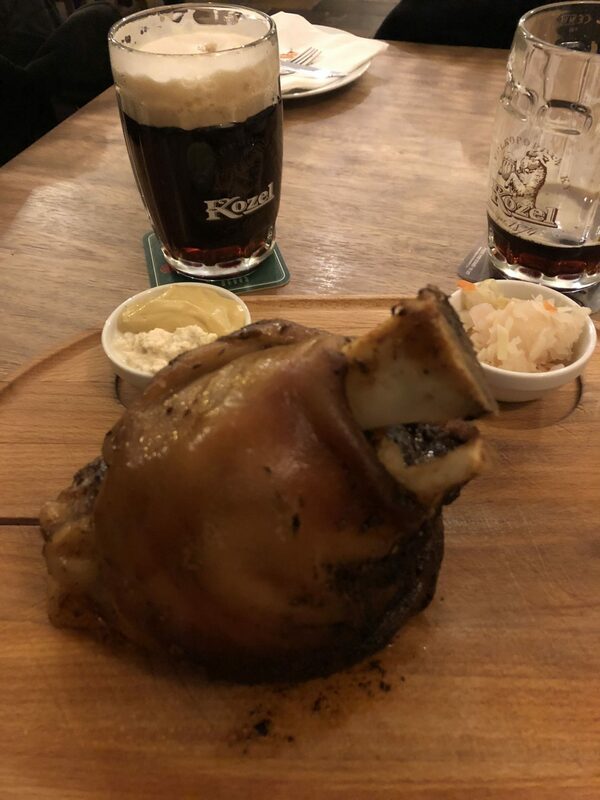 One of the restaurants was Czech cuisine, and Nik finally got to try the famous Pork Knuckle that the Czech Republic is famous for. (You will see this and beef Stroganoff everywhere) Not my cup of tea at all, but Nik assured me it was amazing. I had a beautiful mushroom risotto. No animals were hurt in the making of my risotto hahah….. This meal was better value by a mile, so I would definitely recommend going away from the main square a little. Literally one or two roads over will see you get much more value for money. Again, for the purpose of example we paid around £60 in the Italian on the square, and one road over in a restaurant called Blatnice, we paid around £33 for two courses each and beers. Lesson learnt. Don’t go out so hungry that you cant take time to look around…. I must also mention here the beautiful sweet treats that you can find in any number of street vendors or cafes. 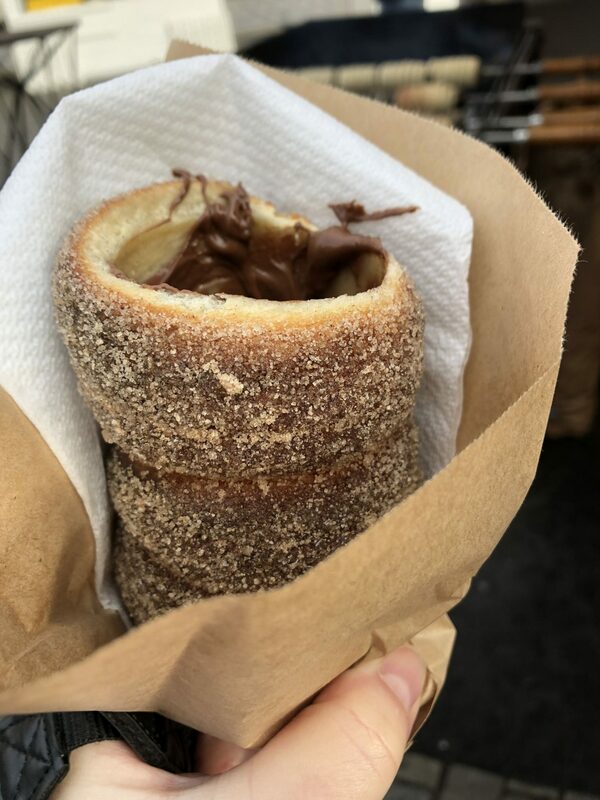 The Trdelnik, or chimney cakes, are available everywhere (again, side streets are cheaper). They are a bread like dough, wrapped around a stick. The outside is then coated in sugar and spices, and caramelised until golden brown. The pastry is then taken off the stick, and your choice of filling spread on the inside. I loved Nutella in mine. Delicious. One of these, and a paper cup of mulled wine or cider, is the perfect warming snack while exploring the city in the colder months. I recommend them fully! Yum. A rooftop bar is also a must in any city I think. We went one morning to The Black Angels bar (and hotel) and took the lift to the terrace restaurant, which is called the Terasa U Prince. On the roof top you have several tables, all with fabulous heaters that keep the cold at bay. The view over the Old Square is just beautiful, and I would recommend going up there when it opens for a coffee or hot chocolate. The views are gorgeous. The bar downstairs is in itself actually an amazing cocktail bar. A dark, quite masculine decor which I blooming loved! You are not allowed to take photos inside the bar, which all adds to the secret feel of the bar. Its a great place and so worth a visit anytime of day. Of course, when you are in Prague, trying the beer is a must. Its like going to Cornwall and not having a cream tea if you don’t at least have a sip. I like a beer, so it was no hardship for me! Drinking is pretty cheap in Prague, with a pint costing you around £2. Something that we did find strange is that the pints are served with a large foam head on them. Where in the UK we serve just a shallow foam, they are about a quarter of the glass. My husband first of all thought it was an inexperienced bar person pouring the drinks…! 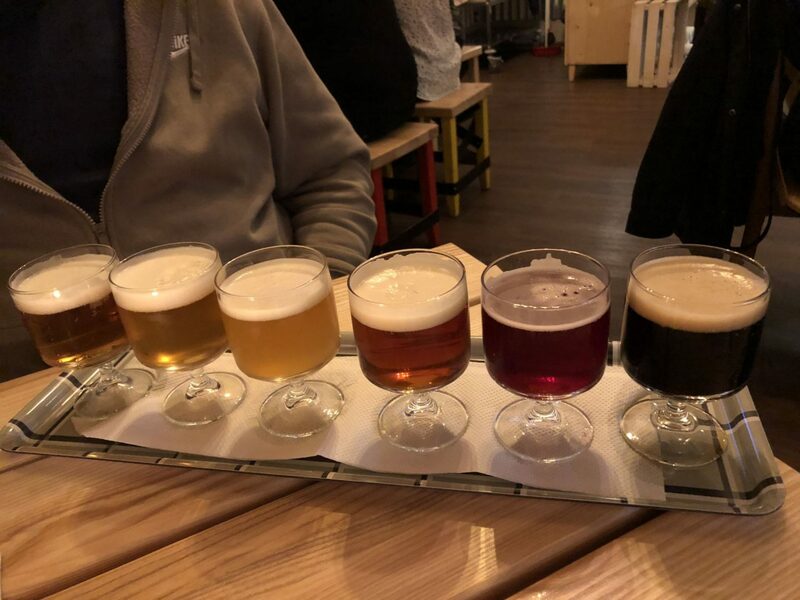 However, not to be put off, we tried a few different varieties, from the traditional Czech dark beers, to Blueberry beer brewed on the premises by the monks at a local monastery. We even tried a “Beer Tray” in The Fat Cat Restaurant, which was six different beers on a try (pictured above). All were delicious and you could very much lose an afternoon tucked into one of the cosy bars…..
We also had a fantastic night in a Jazz club in the Old Square. 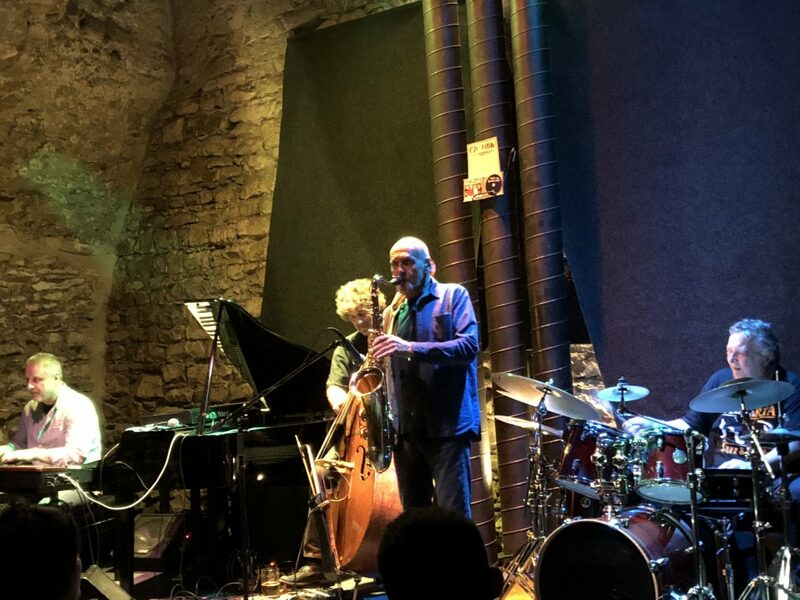 We found that jazz seemed pretty popular in Prague, and as I am a fan of jazz, i was happy about that! AghaRTA Jazz club is a fabulously intimate jazz club, built into a cave. There are only about 20 or so tables of 4/6, so it feels like you are in the front room of some really cool house. The jazz band are absolutely amazing, and we had such a brilliant night here. It costs you around £10 to go in for the night, but the band play from 9 and the club shuts at 1am. Drinks are not expensive, and it was a fantastic chilled evening. I would recommend it fully. So, thats about it for this post on Prague. I wanted to give you ideas of cost, and the practical information, so I hope I have done that. My post on what we did while there will follow soon. I prefer to break the city breaks into two parts, as the information can be a little overwhelming! 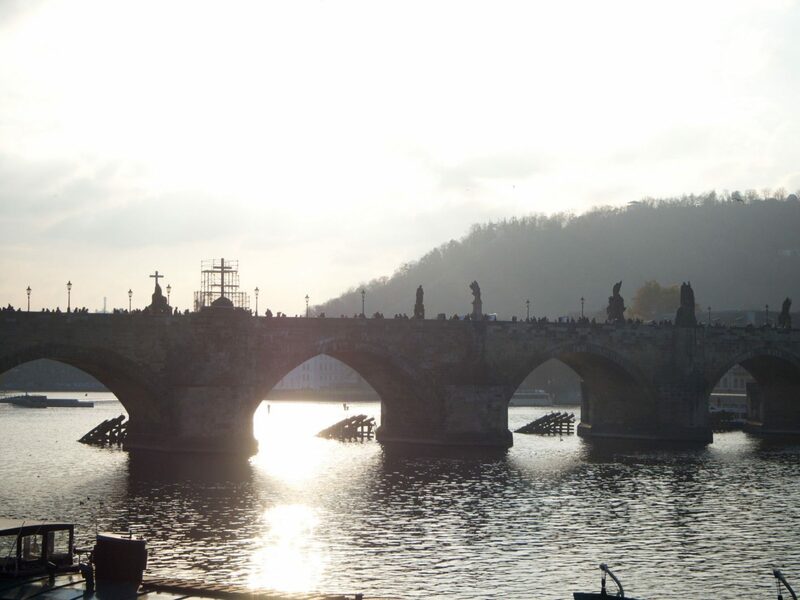 Id love to hear if you have visited Prague? Do you have any other European cities that you think I should add to my list? We are on a mission to go everywhere! "When Did Normal Become Unacceptable?" "Palm Oil – What you need to Know"
This is such a great guide! I have not visited Prague and this makes me really want to look into it. Of course, the bummer coming from the states is that there are hardly EVER any cheap tickets, unless you can book well in advance and our life just isn’t conducive to that. We usually just bite the bullet and go last minute any time we can! Lovely photos and great post as always. Love the way you write! Fabulous post! The food looks incredible. 💖 love the pics. Interesting post Kerry as usual! Prague is somewhere Id like to visit (along with Bruges especially after seeing Colin Farrell in film of same name, but that’s another story!!) I’ve digressed, sorry. Yes Prague, all sounds fascinating and drinks in the jazz bar is right up my street. Loved the pics except the ham hock (not up my street). Keep on traveling and sharing your experiences.